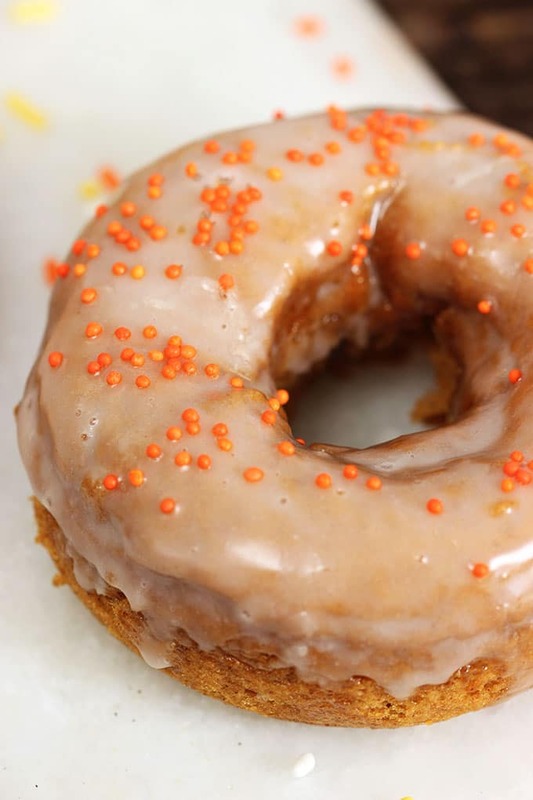 Get your pumpkin spice fix in a soft, tender donut! Two Ingredient Baked Pumpkin Spice Donuts are simple to make with just a box of cake mix and a can of pumpkin. Lightly spiced and dipped in a vanilla glaze, these are your breakfast goals achieved! Our local donut shop sells Pumpkin Spice Doughnuts this time of year. They’re simple, nothing flashy. No flecks of bacon or weird cereal toppings. Just a sweet, vanilla scented glaze and a few tiny sprinkles. I wanted to duplicate them but I now they’re donut recipe is one requiring yeast like these Vanilla Donuts….and I was feeling quite lazy. I just purchased a donut pan that I was dying to test out so I grabbed a box of cake mix, a can of pumpkin and went to town. Honestly, I didn’t think this Baked Pumpkin Spice Donut recipe would work out at all but what I was left with were perfectly round, little cakes of heaven. Because, really…it is just cake shaped like a donut but they’re tender and moist and perfectly spiced without having to put in much effort at all. 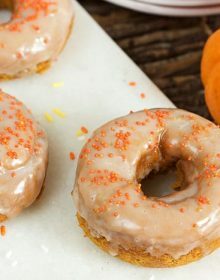 With these Baked Pumpkin Spice Donuts I definitely got my donut fix and they’re a great addition to brunch. My little guy loved them even though I had to wrestle him to the ground to take a bite (he’s become a finicky eater lately…..it’s KILLING ME.). They’re a great breakfast alternative to this Pumpkin Spice Oatmeal or these Pumpkin Spice Energy Bites (because really…who wants to give their kids MORE energy.) But you could also make these Pumpkin Pie Smoothies.….or all of the above for a true pumpkin feast! But definitely…if you make nothing else, make these Baked Pumpkin Spice Donuts because they’re so easy…the kids can do it! 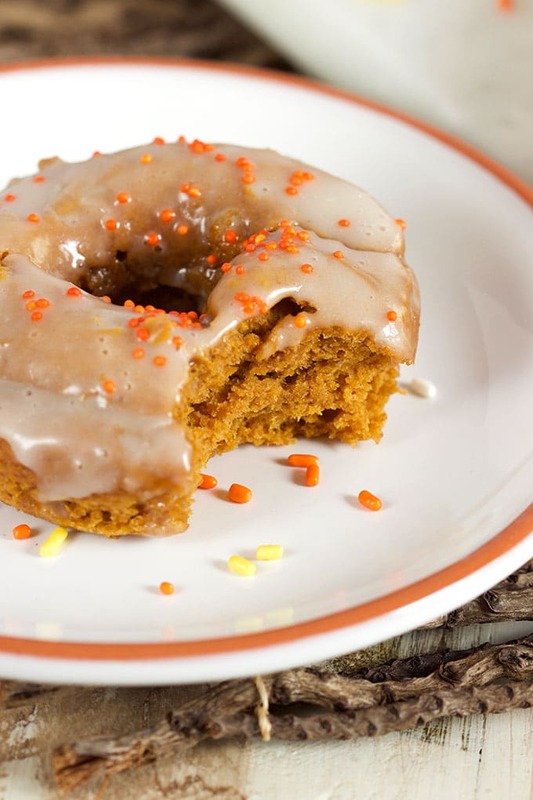 Super easy Baked Pumpkin Spice Donuts are great all year long! 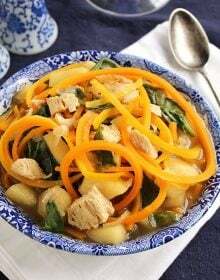 In a large bowl, addd the cake mix and pumpkin puree. Beat the cake mix and pumpkin together until smooth. Transfer the batter to a piping bag and pipe into a donut pan. Transfer to a wire rack and cool for 5 minutes. Remove the donuts from the pan and cool completely. To make the glaze, whisk together the sugar, milk and vanilla. Dip the donut tops in the glaze and return to the wire rack. Decorate with sprinkles if desired. Donuts can be made up to 24 hours in advance and stored in an airtight container. I’m so glad you posted this! I’ve been making a cake using these two ingredients for years, but hubby liked it frosted with fattening icing. Since I have been trying to eat healthier, I hadn’t made it for awhile. 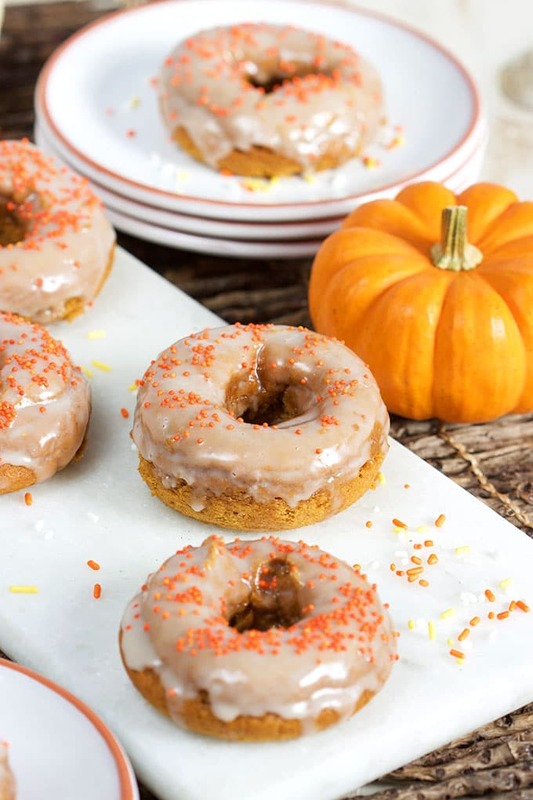 I had not even thought about making as individual donuts (and I love pumpkin donuts!) I can make the 12 donuts and only frost his this way! I’ll be making them Saturday for sure and will post on Instagram! 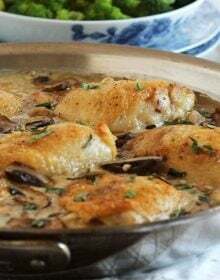 Made these today and posted on Instagram and Facebook – they were perfect! Thanks again for posting! Thank you! I LOVE how easy they are! I’ll go check out your Instagram. These donuts looks great!! Thanks for sharing!!! Greased or ungreased donut pan? Mine was ungreased, however, some others have reported sticking so they used cooking spray. Was wondering if I could substitute the pumpkin cake for a carrot cake mix. YES! I actually started working on one using carrot cake mix…..not with the pumpkin but it would definitely work. Come back and let me know how it worked out for you! Your donuts are so pretty, the glaze looks perfect! 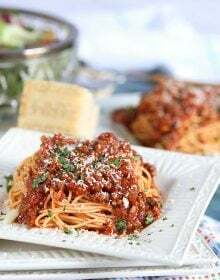 These are so easy and yummy! 🙂 I love donuts! If I use my brownie pan instead donut pan would I need to cook longer? Love theses donuts!! They also freeze well. 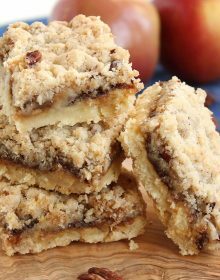 Can you use Applesauce to make apple flavor? Just wondering.if you’ve ever tried this?